Another In-Depth lesson that will defy everything you know about CP! 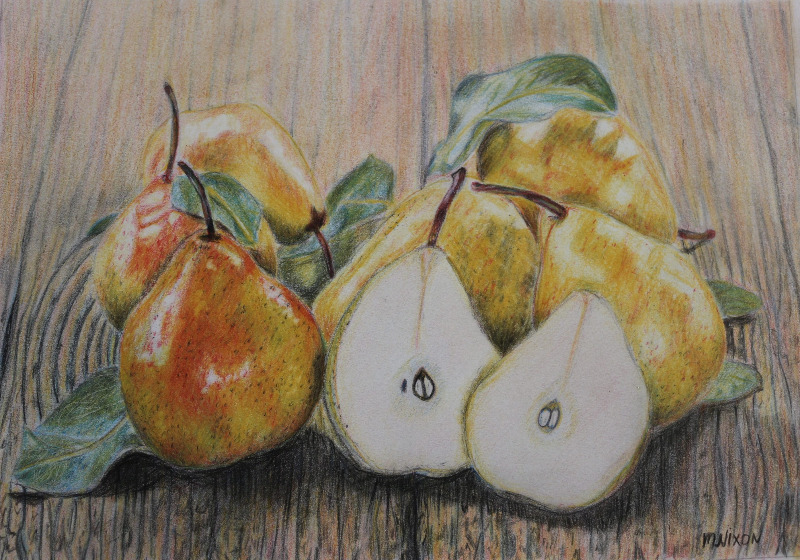 Would you believe these rich, juicy pears were drawn with just FOUR colored pencils? That's right - you'll learn how to create your own range of colors from yellow to orange to green to brown - using only primary colors, plus Black. 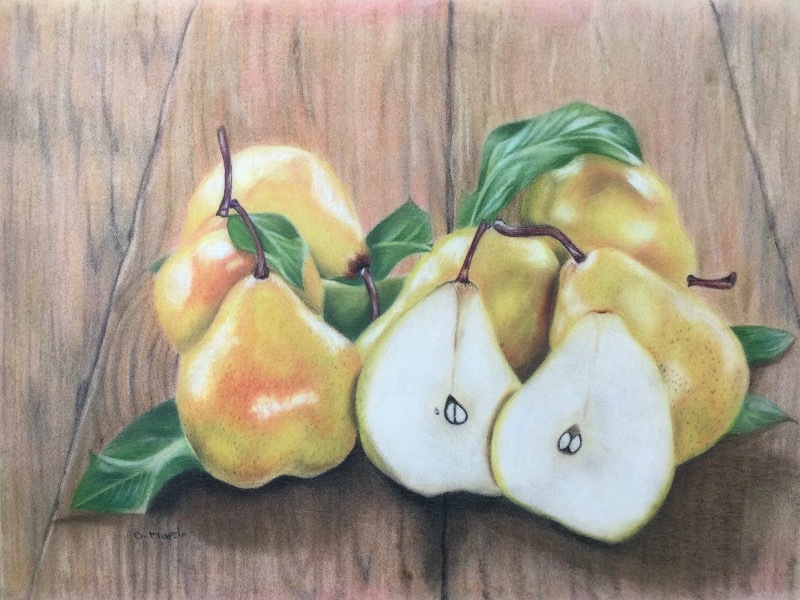 Ekaterina's secret to achieving insanely realistic, vibrant paintings is a secret no more - you can make stunning colored pencil art that you'll want to frame and display proudly - with only a handful of supplies! 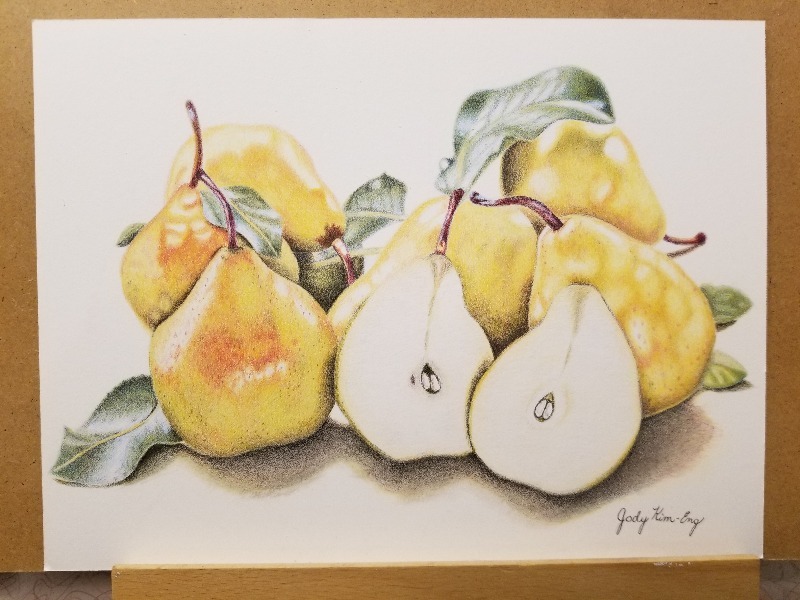 Golden Pears is a great way to try out Faber-Castell Polychromos without having to invest in a whole set - all you need are: Deep Scarlet Red, Dark Naples Ochre, Middle Phthalo Blue and Black. Mixing and Creating Colors: The magic of Ekaterina's technique lies in how she layers primary colors to achieve richly colored fruit that you just want to bite into. Wood Grain: Ekaterina simplifies the process of achieving natural wood grains for the background - you'll be amazed at just how easy it is, even with just 4 pencils. No White Pencil: You'll be challenged by not having a white pencil to add highlights, but you won't get lost. Ekaterina shows you exactly how to create the subtle shiny highlights utilizing the paper itself and primary colors. ♦ List of all materials needed - note that paper and pencils are not included with this tutorial. I enjoyed recreating this piece with just 4 pencils and I learned how easy it was to erase mistakes on smooth paper. This tutorial is not for the beginner artist, however, as the directions expect the artist to know how to layer correctly and how to bring up the values. The actual ref. photo does not represent the artwork Ekaterina created...she is a true artist! She does not just paint what she sees, she paints what she feels. This is something I would like to learn how to do! Note: I did add my version of the art piece. A great tutorial using four colors. This is probably a good tutorial. However, as a beginner my results were very disappointing.